A few years ago we had the opportunity to ski 11,500 foot Mount Ellen, the highest point in the Henry Mountains, which loom impressively over Hanksville (apparently Henry wanted his formal name attached to the mountains, and his nickname attached to a hardscrabble little wayside that’s best known for its milkshakes on the way home from Lake Powell). The Henries have the distinction of being the last mapped range in the US, which is indicative of their relative remoteness, and are a high island poking out of some of the most dramatic desert environments in the world, with the Waterpocket Fold to the west and Canyonlands to the east. It also offers a fine, 3000-foot ski line if you are lucky enough to catch the combo of the dirt road not being snowed in or a recently-melted grease fest and still have enough snow to ski its dramatic east face. While on that ski tour we noticed that our access road continued on up and over a high pass, and we thought “that would make a good bike tour sometime” and didn’t give it much thought again until we were looking for a nice 3 day loop in the southland, remembered that road, and thought it would be a good conduit from one side to the other. We started our loop – which was essentially a bulged-out loop around Capitol Reef National Park – in Torrey, and a storm in the north created a big west wind that blasted us through the park and along Highway 12 towards Hanksville, which enabled us to get some decent miles despite starting our weekend Saturday morning driving from Salt Lake. Not far from Hanksville we came across a funky little house/farmstand with a sign that said “homemade pesto!” on it; being a sucker for farmstands and good local food we pulled in, and after some amount of hollering finally found the proprietor; a classic aging hippie organic farmer who seemed a bit out of place near Hanksville. After spending way too much money with him buying jars of pesto, organic kale and arugula, etc. I couldn’t help but notice that he had some nice pastureland and adjacent outbuildings, and if you’ve ever driven through Hanksville during a windstorm you know that it also be pretty brutal sandstorm, and those buildings looked like pretty good windbreaks with no sand upwind. “Uh, it’s late in the day and we are looking to camp soon; any chance we could camp here in your pasture in the lee of one your buildings?” fully anticipating that he’d say “Sure! No problem!”, especially after we’d bought probably most of his week’s worth of sales at his little shop. To our surprise, however, he said “No, can’t do that.” Huh? As touring cyclists we’ve become so accustomed to gracious people we meet along the routes that we were a bit stunned to be turned down. But so it goes, and we wobbled a couple of miles down the road and found shelter behind a cliff for a decent-enough campsite. 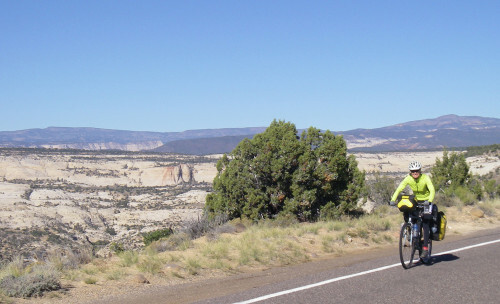 There aren’t too many opportunities in these parts to do 6000 foot climbs, but starting in Hanksville and ending at Bull Creek Pass is all of a 6400 climb on a gravel road. Though it was a short trip and therefore we didn’t have a ton of food, we were a little nervous about our opportunities to find water, so were toting a fair bit of weight as we ground slowly up into the Henries. It was a longggg haul, but at least it got a fair bit steeper towards the end! Finally we topped out at the pass and took in the sweeping desert views that we had seen a few years prior on our ski tour. Originally we had thought that we’d take the opportunity to hike up to the south peak of the Mount Ellen ridgeline, but after the long climb on the bike and our desire to find a decent camp we elected to bounce down the west side of the pass. 5000 feet of bumpy, rocky, and dusty descending got us down to the Notom Road, which is a north-south connector between Highway 12 at the east entrance to the Park and Bullfrog Marina on Lake Powell. Though we knew it was not paved in that section (the northernmost 10 miles of it is paved) we assumed that it was well-traveled enough and it was spring so there wouldn’t be much sand to slow us down. However, ‘twas not the case that year. Periodic bits of hard clay were interspersed by hundreds-of-yard sections of quad-crushing, snail-slow sand, and it was tempting to turn about to go north on the Notom road and make our loop considerably smaller. 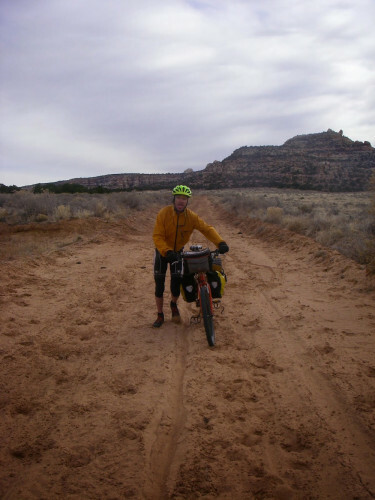 However, the other main goal of our loop was to ride the famous Burr Trail that climbed up onto and traversed that magical Waterpocket Fold, the thought of going forward through maybe??? less sand that we didn’t know sounded better than backtracking through the sand that we did know, and we wanted to make our tour longer rather than shorter, at least at that point. Plus there was a campground listed on the map, and we figured there’d be water there, because…hey, it’s a campground! 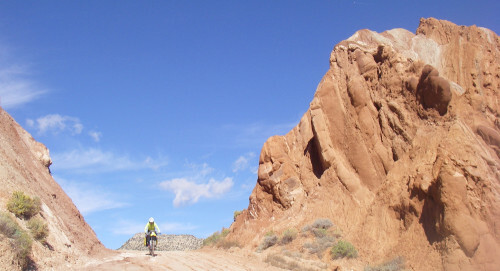 A 2.5 day tour around Capitol Reef National Park with a climb over Boulder Mountain and a stretch on the Burr Trail. Base Map courtesy of Benchmark Maps from the Utah Road & Recreation Atlas. We rolled into the campground late in the day, pretty whupped but happy to have made it through a big effort, and since the following day was our last and we felt really far from our starting spot we hoped to get some water and keep on “rolling” (pushing?) down the road towards the Burr Trail. However, a quick lap around the loop of sites did not yield any water spigots, and we realized that “primitive campground” was code for “no water for thirsty cyclists.” We sat down for a snack to evaluate our options, and just then we heard the rumble of a truck rolling up towards us and soon enough a camper appeared that had a nice couple in it who were not only happy to share a couple of gallons of water but also a coupla cold beers, so our decision got made for us. With fresh morning legs and longer sections of hard clay we made short work of the rest of the Notom road, then turned up the famous “Muley Twists” section of the Burr Trail that ascended up to the mesa that was the Fold. On top it turned to pavement, and we rolled onward and upward toward Boulder, where we knew the famed Burr Trail Grill was awaiting us, since we were running out of food (in anticipation of the Burr Trail Grill). Hitting Boulder in mid-afternoon we were surprised to find that the Grill hadn’t yet opened for “the season” (isn’t Memorial Day “the season?”) and all we were able to find to fuel us up for the last grind up and over Boulder Mountain were a couple of muffins. But probably just as well; the burger, beer, and piece of banana cream pie that we likely would have mowed into probably would have hurt more than it would have helped. We had driven over Boulder Mountain many times and never ridden it, despite saying every time: “We gotta ride this!” As always, you never really get a true sense of a road until you ride it, and the realities of a 3000 foot climb and a “descent” that has some additional climbs in it can be a bit harsh with heavy bikes and tired legs. But we chugged along and soon enough we were on the final coast down into Torrey. 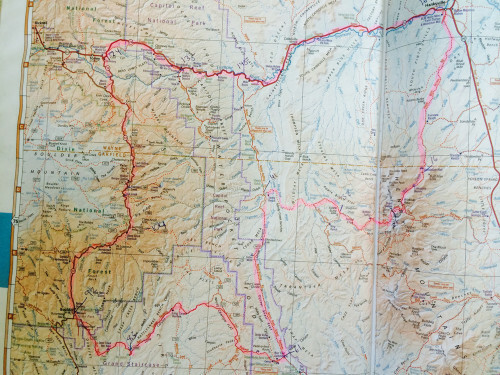 In hindsight it was a bit of an ambitious route for what was essentially a 2.5 day tour at 170 miles and over 11,000 feet of climbing, but it was clearly doable and there are ways to make it shorter or just take another day (and be strategic about water). And make sure the Burr Trail Grill is open!